In his usual manner, John T. Frye uses tech-savvy teenage experimenters Carl Anderson and Jerry Bishop to teach a lesson while writing a compelling saga. 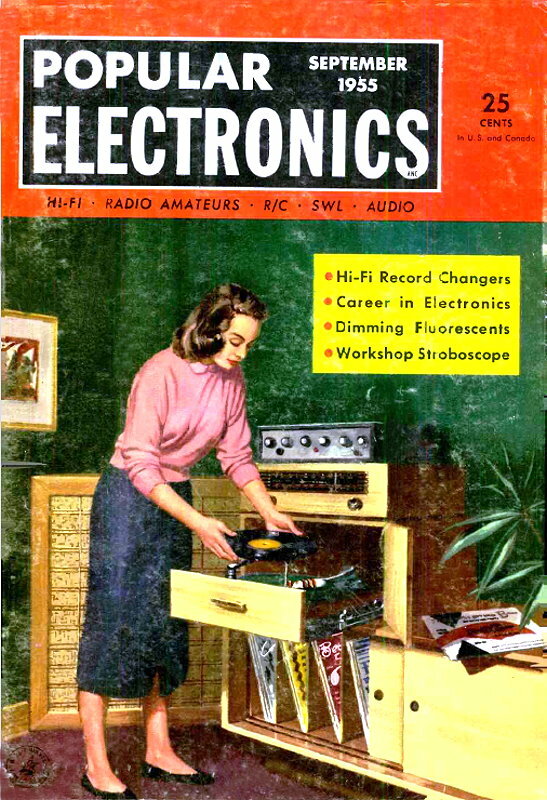 In this case Jerry gets "bitten" by house current while fiddling with a receiver chassis. Before certain safety measures were required by law, many electrical devices - radios, televisions, vacuum cleaners, shop tools, kitchen appliances, etc. - were sold with with either existing shock hazards or the potential for (no pun intended) a shock hazard in certain usage or failure modes. Before the advent of polarized two-pronged plugs and grounded 3-prong plugs, some devices presented hazardous voltage levels to the user by virtue of a direct connection to exposed conductive (metal) surfaces. In this instance, under normal operational conditions with the chassis installed in its wooden case and plastic or phenolic control knobs on the front panel the house voltage (or possibly higher from the high voltage vacuum tube plate supply) the users would be sufficiently isolated from danger. BTW, while a UL (Underwriters Laboratories) certification is not required, a certification from some approved facility is. They need to verify compliance with OSHA, NEC, and other standards in order to place their "mark" on a product. 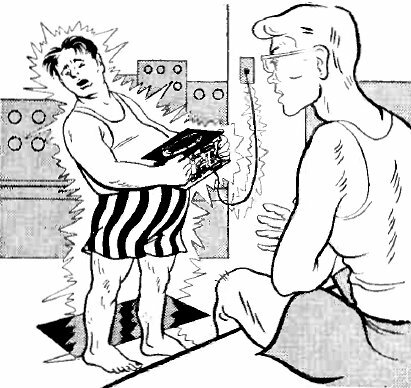 Smart technicians take every precaution against electrical shock; Jerry finds out the hard way. August had been a pretty hot month and now September was starting out the same way. Even down in Jerry Bishop's basement laboratory it was warm, and the youth puttering at his workbench was barefooted and wearing only a shirt and shorts. 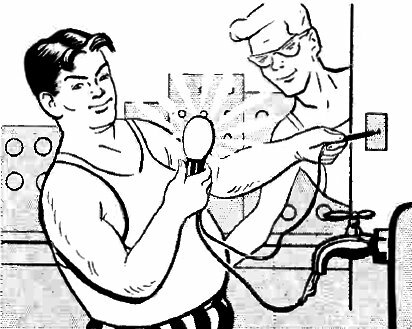 His pal, Carl Anderson, was seated on the bench swinging his long legs idly back and forth as he watched his chubby friend working on a radio receiver. "The shielded loop antenna fastened to the back of this set is really directional," Jerry remarked, as he picked up the chassis and stepped away from the bench so that he could turn the playing receiver about. "Wups!" he said, as the tangle-shortened line cord pulled from the wall socket. He set the receiver down on the bench, untangled the cord, replaced the plug in the wall socket, picked up the set, and once more stepped away from the bench. Suddenly his body gave a convulsive jerk and then became rigid. A low moan forced its way between his clenched teeth. The cords in his neck and in his quivering wrists stood out tautly beneath the skin. His staring eyes looked agonizingly at his friend and then shifted imploringly over to the receiver a.c. plug in the wall socket. Carl, whose widening eyes had been staring through his horn-rimmed glasses at the strange behavior of his companions finally realized what was wrong; and in a single motion he leaped from the bench and tore the receiver line cord from the wall socket. In that same instant, Jerry dropped the chassis to the concrete floor with a resounding crash, tottered backward and collapsed on the leather -covered couch along the wall. "Hey, Jer, are you all right ?" Carl asked anxiously, as he bent over his friend. "What was wrong? Were you getting a shock from that set? Want me to get your folks or call a doctor? Hey, why don't you answer me ?" "Gimme a chance!" Jerry gasped, as he panted for breath through a wide-open mouth. "I'll be all right, I think, but that was mighty close." For a few minutes he continued to gasp for breath, but gradually he began to breathe more easily and color started to return to his dead-white face. Carl, who had been watching him narrowly all the while, relaxed a little and returned to the chaffing way of talking that normally prevailed between the two fast friends. "Heck!" he drawled, "I was hoping I might get a chance to use that new method of artificial respiration I've been practicing down at CD headquarters. Maybe," he said hopefully, "I ought to give you a little of it anyway. It won't hurt. I just sort of play you gently like an accordion." "Keep your greasy paws off me!" Jerry warned, as he struggled to a sitting position and ruefully examined the seared white welts burned across the inside of his fingers where they had been in contact with the edges of the charged chassis. "Man, do those fingers feel hot! They must have a real fever in them. There's a nasty odor of burned flesh about 'em, too," he remarked, wrinkling his nose in distaste. "Just wait a couple of hours until they begin to get sore," Carl encouraged. "Well," Jerry said as he stood up rather shakily, "let's see if we can find out where I goofed. This whole thing was a shocking surprise to me, if you will allow a poor sick man a pun. I thought I was taking every precaution." Carl set the receiver back on the bench, and the boys looked it over. Fortunately, it had landed on a corner that had doubled under and absorbed most of the shock. When a couple of tubes that had been jarred from their sockets were replaced, and the set was gingerly plugged in, it played normally. "Pull the plug and let's see if we can reconstruct the accident," Jerry suggested. "Until we find out what went wrong, I'll be afraid to touch another electrical device of any kind. In some way the 117-volt line current must be reaching the chassis; although, in a transformer set like this, it shouldn't. Some a.c.-d.c. receivers have one side of the line connected directly to the chassis; but this is never done with transformer sets. Hm-m-m," he broke off as he reached for the ohmmeter probes, "I'll bet that's it." "What's it ?" Carl demanded. "Stop trying to sound like a pill-pusher with those knowing 'hm-m-m's of yours." "Each side of the line is bypassed to the chassis through a .05-μfd. capacitor," Jerry explained. "I'm thinking that one of them may be short-circuited." Sure enough, as the probes were touched to the leads of one of the capacitors, the meter pointer indicated zero resistance. "That explains everything," Jerry said contentedly, as he tossed the probes back on the bench. "To you, maybe; but not to me," Carl denied. "Only one side of the line was shorted to the chassis that both of your hands were holding. I thought you had to have a complete circuit path before electrical current would flow. Just touching one wire doesn't complete a circuit. You can't fool me. I've seen a bird roosting on a high-tension wire carrying thousands of volts." "You're forgetting something. One side of the line coming into the house is grounded right out at the transformer. This is true of all two-wire services. For that matter, one wire of a three-wire service is grounded, too. The current was going from the ungrounded or 'hot' wire through the shorted capacitor to the chassis, then through my body and bare feet in contact with the damp cement floor, and finally back through the earth to the pole transformer out in the alley." "You mean all you need to get a strong current flow is one wire and a good ground ?" "Sure; I'll show you." As he said this, Jerry picked up a short extension cord with a light bulb in its socket and removed the plug from the end of the twisted leads. Separating these leads, he connected a battery clamp to the end of each one. 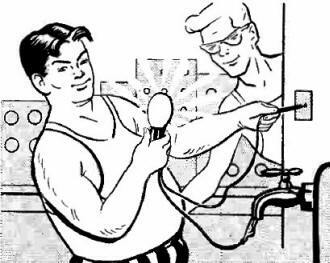 Then one clamp was clipped to the brass valve handle of a water faucet at one side of the basement, and the other was fastened to the end of a test lead. Jerry thrust the probe end of the test lead into one of the openings in the wall receptacle. Nothing happened. "That's the grounded side," Jerry remarked as he removed the test prod and thrust it into the other side of the receptacle. Instantly, the lamp in the socket glowed with normal brilliance. "Of that part," Carl admitted cautiously, "but there're still some things I don't understand. Why didn't you get a shock as soon as you touched the chassis ?" "I was standing on this long strip of rubber carpet I put in front of the bench just to avoid having contact with the earth while handling electrical equipment; but you'll recall that I stepped backward off the rubber mat just before the jolt hit me." "But you were off the mat the first time before the plug pulled out. Why didn't you get a shock then ?" "Because the plug happened to be in the socket in such a manner that the side of the line shorted to the chassis through the capacitor was the grounded side. When I straightened out the cord and replaced the plug, I must have reversed the position of the plug prongs so that the hot side of the line was the one shorted to the chassis. Then all that protected me from shock was the rubber mat, and when I stepped off that -"
"You began to shake, rattle, and roll," Carl finished. "You can say that again. I felt just as though my whole body was clamped in a huge vise that was squeezing tighter and tighter. You'll never know how desperately I was trying to yell at you to jerk that cord, but I couldn't get out a mumbling word." "Have you figured out what you did wrong ?" "There's quite a list. First, standing barefooted on a damp cement floor while handling electrical equipment of any kind is just asking for trouble. Second, I should have realized that only the capacitor stood between me and a possible fatal shock; and I've replaced enough shorted capacitors to know how easily they can fail. My basic error was in not using my imagination to picture what could happen and then taking precautions to see that it didn't." "Such as wearing shoes, Nature Boy ?" "Ordinary shoes would not insure safety. What I should have done, and will do immediately, is buy an isolation transformer that we'll use consistently. This is basically a simple two-winding transformer. The primary winding goes to the line, and the secondary winding feeds the device being tested. Since the secondary has no connection to the ground, there is no danger of being shocked through contact with the ground. The only way you can get shocked while using such a transformer is to contact both secondary leads simultaneously. In addition to providing this safety, the ordinary isolation transformer has tapped windings so that secondary voltages slightly above, equal to, and slightly below the line voltage can be had from the isolated secondary." "I didn't realize you could get such a jolt from 117 volts. I always knew such a voltage would make you jump, but I didn't realize it was really dangerous." "Don't you believe it! I'll bet more people are electrocuted with the 117-volt line current than with any other potential, simply because it's so easy to contact and because it is treated with so little respect. A scientist once told me that if the skin resistance were reduced to zero a person could be killed by only six volts. Ordinarily, the oily skin provides ample protection against such low potentials, but when the skin is wet with salty perspiration as mine was, the skin resistance drops sharply; and once the current starts to burn, it quickly drops the skin resistance still more." "Then you think those smart alecks who stick their fingers into light sockets to show how much juice they can take are not being very bright." "That's putting it mildly! Only a jerk or a real square would do a stupid thing like that. Electricity makes a wonderful friend and servant, but it can become a vicious, lightning-fast killer if you treat it carelessly. A smart technician takes every possible precaution against getting even mild shocks, for under the right circumstances they can be fatal." "Doctors say that occasionally a comparatively mild shock can trigger the heart into quivering in a manner that interferes with its normal functioning. They believe this accounts for the deaths that sometimes occur from low- current shocks." "Maybe that's why it's a good idea always to use only one hand when working on equipment where there's a possibility of shock." "Check. Keeping one hand in your pocket under such circumstances is a strictly professional procedure. It avoids the possibility that a dangerous current can enter one hand and go out the other, and pass through the vulnerable chest cavity on the way across." "Carl, I want you to show me how to do that new artificial respiration business you were talking about. In case of shock, artificial respiration immediately applied is the best possible first-aid treatment to use until a doctor can be reached. Getting started with the treatment just as soon as the body is freed from the current is the important factor. A delay of only a few seconds in beginning artificial respiration may spell the difference between life and death." "Fine!" Carl agreed; "and that gives me an idea. Let's hold regular surprise drills right here in the basement. After I've shown you how the artificial respiration is done, every few days one of us will fake being shocked. All he will have to do is touch a piece of electrical equipment that is plugged in and become rigid, just as you did. Then the other fellow will free the `actor' from the 'hot' object, taking care not to be shocked himself. This will be done either by pulling the plug as I did or by opening that master switch that cuts off the whole bench and all its outlets. Then, the guy doing the acting will collapse on the floor, making himself as limp as possible. The other fellow will straighten him out and start artificial respiration just as quickly as he can, and keep it up for at least a couple of minutes. If we keep doing this, well soon be prepared to handle a real case of shock almost automatically. Constant drilling is the best insurance against getting rattled in an emergency." "Truer words were never spoken!" Jerry applauded. "If we use our heads and take the precautions we should, the chances are that neither of us will ever have to use first aid here in the basement; but it will be mighty comforting to know both of us can, and you never know when we may have a chance to save a life somewhere else. Working with electricity and not knowing how to apply artificial respiration is about as foolish as it would be for an explorer to start into the South American jungle without a snakebite kit."